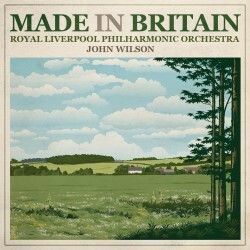 Made in Britain celebrates a rich and nostalgic period of English music surrounding the turn of the 20th century, including evergreens such as Vaughan Williams’ The Lark Ascending (for years Number 1 in the Classic FM Hall of Fame) and Elgar’s Salut d’amour, as well as the folk inspired Two English Idylls by Butterworth and English Folk Song Suites by Vaughan Williams. The programme opens with Walton’s commedia dell’arte concert overture Scapino and closes with the Nell Gwyn Overture by Edward German, music director of London’s Globe Theatre from 1888. Along the way we take a walk through Delius’ Paradise Garden from his opera A Village Romeo and Juliet, and stroll through Bax’s woodland evocation The Happy Forest. Overseeing this celebration is none other than today’s leading interpreter of British Music, John Wilson conducting the Royal Liverpool Philharmonic, the UK’s oldest professional orchestra which, founded in 1840, is steeped in this glorious musical tradition. Made in Britain catches a prevailing mood and taps into today’s all-encompassing appetite for an evocative era.